The National Transportation Safety Board’s (NTSB) role is not well understood by the public. And this problem isn’t limited to international accident investigations, like the two fatal crashes of Boeing’s 737 MAX. That was part of NTSB Chairman Robert Sumwalt’s message to attendees at the April 5th luncheon of the Aero Club of Washington. The Chairman preceded his remarks with a short video that summarized the NTSB as an independent Federal agency, charged by Congress with investigating every civil aviation accident in the United States, as well as significant accidents in other modes of transportation – railroad, highway, marine, and pipeline. The NTSB determines the probable cause of the accidents and issues safety recommendations aimed at preventing future accidents. These non-mandatory recommendations are often issued to other Federal agencies – agencies that create regulations designed to keep transportation safe. The Chairman underscored this point by noting that the NTSB investigates – but it’s the Department of Transportation (DOT) that actually regulates. Aviation is just one of the many forms of transportation regulated by DOT, an umbrella organization which oversees numerous other agencies, such as the Federal Aviation Administration (FAA). Sumwalt observed that the FAA is doing a great job of keeping commercial air transportation safe. To illustrate, he noted that the worst fatal domestic accident in recent history involved a hot air balloon. Commercial aviation in the United States has come a very long way from the days when domestic airliner crashes were commonplace. And those days are within the living memory of most adults in this country. 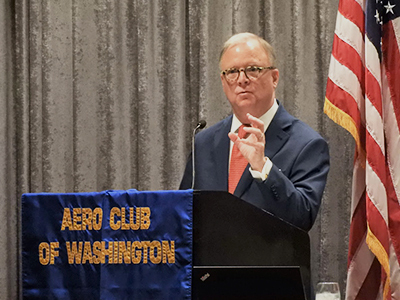 Sumwalt provided remarks at the April 5th luncheon of the Aero Club of Washington. Yet it is perhaps because commercial aviation has become so safe that the public has so little idea of what the NTSB does. Chairman Sumwalt explained that the International Civil Aviation Organization’s (ICAO) Annex 13 gives the role of crash investigator to the country in which the accident occurred. As a result, there are times when the NTSB does not have a right to participate in these investigations – much less lead them. However, in the case of foreign accidents, the agency may be entitled to appoint a representative to the investigation when, for example, the crash involved an aircraft manufactured in the United States. When the agency participates in an investigation, it will often select technical advisers to provide assistance. And these advisers are typically employees of the FAA, and the aircraft manufacturer. The Chairman emphasized that, despite the public outcry for immediate answers, proper investigations take time. He went on to explain that U.S. federal law actually prohibits the NTSB from releasing information on a foreign investigation, unless the “country of occurrence” authorized the release. Partially as a result of this information vacuum, the Chairman noted that television pundits seldom know what they’re talking about, and frequently make baseless speculations. Similarly, he noted that preliminary reports, such as the one issued yesterday by Ethiopia’s Transportation Ministry, can and often do change. That being said, the NTSB’s role as “investigator” involves helping to gather and validate data, so that the regulator can then make a decision. The Chairman underlined this point by noting that the FAA grounded the MAX – not the NTSB. However, that decision came after the NTSB and Boeing analyzed data gathered from Aireon, a global-aircraft tracking company. The result of that data analysis – a process which took time to perform properly, said the Chairman – resulted in the FAA’s ultimate decision to ground the MAX.